With the inaugural weekend of AAF action in the books, I have officially bought in to the Alliance of American Football. With former NFL players and college stars littered throughout the 8 rosters, what’s not to love about the NFL’s D-League? A safe middle ground between the stars of the NFL and the lack of talent and defense at the collegiate level, the AAF is the perfect offseason football for football fanatics. While this may just seem like a less-talented NFL at first, there are rules in the AAF that keeps the game exciting and fast-paced. With no TV timeouts or challenges (there is an official who can correct calls in real-time), AAF games feel much shorter than the typical NFL game. Not only is the game faster, but some of the more boring plays in football are removed. The point after try has been completely eliminated in this league, forcing teams to go for two after every touchdown. The kickoff has been replaced by the ball starting off at the 25-yard line. This also keeps players on the field, as kickoffs have been known to create plenty of injury problems. On top of keeping the game fast-paced, there are some new rules that keep the league fresh compared to other leagues. For example, the onside kick has been replaced by the onside conversion. The onside conversion can only be called if a team is losing by 17+ points or if there are less than 5 minutes in the fourth quarter. If it is called, the team losing gets the opportunity to convert a 4th-and-12 from their own 28 yard line. After this play the game simply continues as usual, according to whether or not the losing team converted. The league also appears to be oriented towards the offensive-loving fan, as the defense can only rush five, in order to protect the quarterbacks. The eight teams in the AAF are comprised of players within their given region. Players are allocated to each team based on where they played collegiate football or where they played most recently professionally. For example, the Arizona Hotshots get players from the Cardinals, Ravens, Bears, 49ers, Edmonton Eskimos, and several major colleges near or in Arizona, including Arizona, New Mexico, and UCLA. The Arizona Hotshots are 1-0 after their 38-22 victory over the Salt Lake Stallions. Head coached by former UCLA coach Rick Neuheisel, the Hotshots are led by a one-two punch at quarterback featuring former Cardinal Trevor Knight and former Wake Forest Demon Deacon John Wolford. Other interesting names on the Hotshot depth chart include two former Eagles Dexter McDougle and Josh Huff, and former Jets kicker Nick Folk. Despite a star-studded front office including Mike Vick as a team advisor and former Vikings coach Brad Childress within the organization, the Legends lack noticeable names on their depth chart. This was evident in their 6-40 loss against the Orlando Apollos in week one. Perhaps starting quarterback Matt Simms (son of Phil and brother of Chris) will be able to turn their fortunes around. 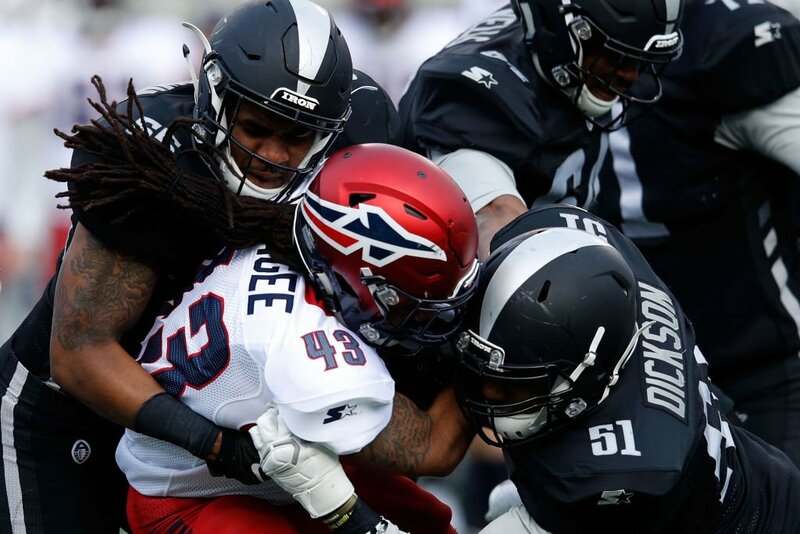 The Birmingham Iron have the biggest star in the AAF in their backfield with former Alabama running back Trent Richardson. Richardson is one of many AAF players looking to make an NFL return in the near future, and he is trying to use the AAF to do so. His AAF debut was successful, with two touchdowns and a 26-0 win over the Memphis Express. The Iron have one of the strongest defenses in the league, as they have recorded the first shutout in the history of the AAF. The Memphis Express had the least impressive of all of the debuts from this past weekend. Former Jet and Penn Stater Christian Hackenberg captained the offense to an inspiring 67 yards and an interception on 23 passes. Head coached by Mike Singletary (yes, you read that right), Memphis looks like they could very easily end up at the bottom of the AAF in its inaugural season. Other notable players on the Memphis Express include former Ram Zac Stacy (pictured above) and former LSU and Titans quarterback Zach Mettenberger is the second-string to Hackenberg. The Orlando Apollos delivered the statement performance of the AAF’s inaugural weekend, dominating the Atlanta Legends 40-6. Led by the stellar defensive performance of former Redskin and Seahawk Terence Garvin (pictured on left) who finished his outing with ten tackles and 2 interceptions. The Apollos also have the most decorated coach in the league in Steve Spurrier, who called an ‘Orlando Special‘ during the blowout. The Salt Lake Stallions may have lost their first game in franchise history 38-22 against Atlanta, but this team has one of the most talented rosters in the league. With two noteworthy former NFL running backs in Branden Oliver and Matt Asiata, the Stallions are not a team to take lightly in the inaugural season of the AAF. The San Antonio Commanders set the world alit with a viral hit coming from linebacker Shaan Washington, bringing the world of AAF football into mainstream media. San Antonio’s defense looked incredible in their home opener, allowing only one score in a 15-6 win over San Diego. This team is full of former NFL players including Kenneth Farrow, De’Vante Bausby, and Kurtis Drummond. San Antonio’s defense should see them towards the top of the AAF by season’s end. The eighth team in the AAF is the San Diego Fleet. Their defeat in week one against the San Antonio Commanders gave them the first loss in the history of the AAF. Now that’s something to be proud of! Led by Arizona State alum Mike Bercovici (who was the recipient of the aforementioned viral hit), San Diego struggled to get their offense going in the Alamodome. The Fleet consist of a few big name former NFLers including Gavin Escobar and Ron Brooks. With eight fun teams to root for and plenty of former NFL players scattered across the league, I am proud to call myself an AAF fan. Football has always been my favorite sport, and I am willing to give the AAF a chance if it means I get to continue watching football for a few more months.